This beautiful 2/5 carat diamond bridal ring set from Perfect Fit has a gorgeously elegant mix of round and baguette cut stones set in an emerald shape with diamond encrusted shoulders. The 18 carat white gold band lends the perfect backdrop to make the diamonds - the centre piece to this exquisite and majestic bridal set. 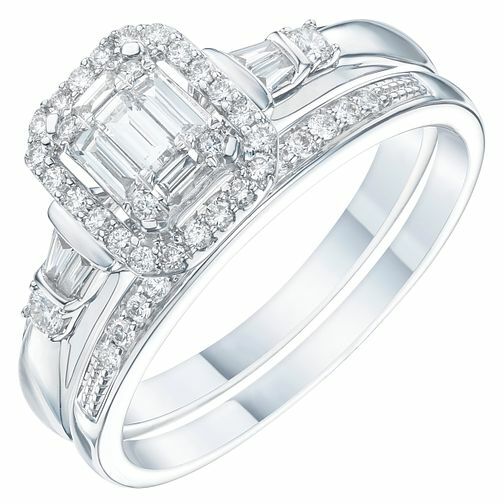 18ct White Gold 2/5ct Diamond Perfect Fit Bridal Set is rated 2.3 out of 5 by 3. Rated 5 out of 5 by Anonymous from Absolutely Gorgeous I got this ring for my engagement & I really could not have picked better myself. It's always getting complements! I absolutely adore it. Rated 1 out of 5 by Anonymous from Stone fell out...TWICE! This was given to me as my engagement ring but unfortunately after only a few months one of the halo stones fell out. It went off to the repair centre (as I’d paid for the insurance). It came back and within a week (despite wearing it around my neck) another stone from the halo section fell out! Poor quality and extremely disappointing. Especially as an engagement ring which should last a lifetime.